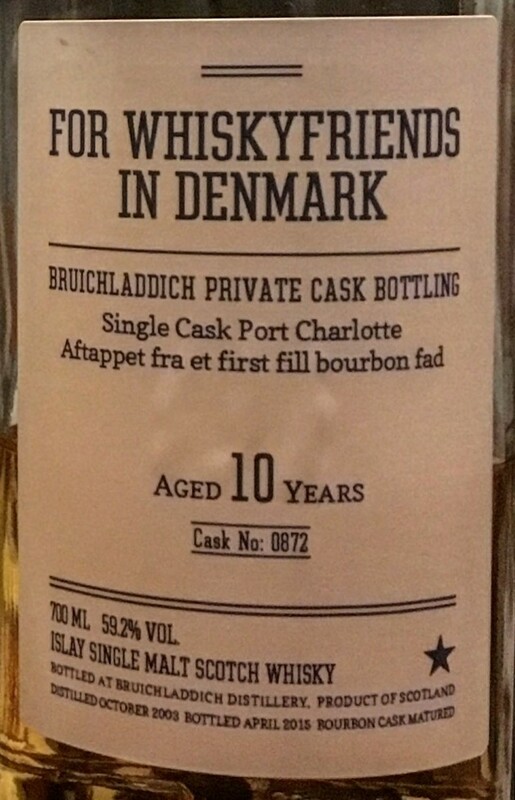 This is a “Private Cask Bottling” bottled for ”For Whiskyfriends in Denmark” and comes from a Bourbon cask (#0872). It is at least 11 years, but for some reason it only states aged 10 years on the bottle… Peat and clean fresh cut grass in the smell. Hints of vanilla and toffee. The peat is more dominant in the taste. Creamy vanilla peat with just a hint of citrus in the background. The grass has turned to hay, and that is what is most dominant in the finish. Some oak and white fruits as well. Oak spices and apples. Not that complex, but the balance is fine. Young and vibrant, yet older than 10 years so it doesn’t feel under-matured. A very straightforward honest dram from Bruichladdich. Definitely value for money! I will give this 86/100 (21/22/22/21).